You know you're an adept executive. You understand the industry. Leadership is stamped into your DNA. But the senior executive doesn't know that. Worse, he barely has time to read 10 of his 10,000 emails. How can you write an executive resume that conveys your strengths, and that he will actually read? This guide will show you:. An executive resume example better than 9 out of 10 other resumes. How to write an executive resume that lands more interviews. Executive resume writing tips and examples for how to list skills and achievements. How to describe your experience on a resume for an executive position to get any job you want. Executive Resume Example - See more templates and create your resume here. What's the Best Format for an Executive Resume? "90% of what you're saying ain't coming out of your mouth." That quote from the movie Hitch describes why resume format is so important. We're not judged merely by what we say, but also how we say it. Your executive resume must broadcast the right message loud and clear. Start with a trusted format like the reverse-chronological layout. It presents your freshest victories up front. Use clear, powerful fonts. Nothing flashy. Lead with big headings, contrasted with clean white space. Spell check. Grammar check. A company is constructed of a thousand details. Show you'll care for every one. Finally, save it as a PDF. An executive resume PDF preserves its formatting. MS Word formats can turn to soup in transit. Just make sure the job offer doesn't outlaw PDFs. 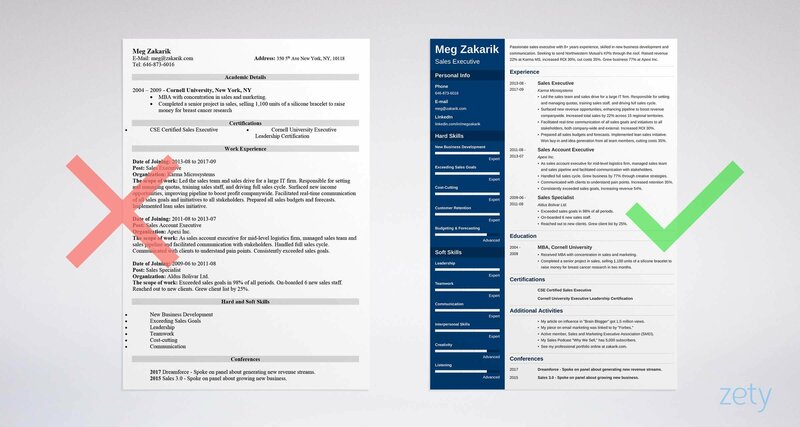 Pro Tip: Rethink the two-page resume format. Account executive business resumes are elevator pitches, not peel-the-onion exposés. No one's going to read your perfect executive resume. It's too long. They've got ten thousand things to do, and 200 other resumes to read. It's sad, but true. The average recruiter spends just six seconds looking at each resume. Your goal? Make them love those seconds. Make them ravenous for more. Do it with a resume summary that'll blow their Gammarelli socks off. That sounds big and hairy, but let's break it down. Write the rest of your resume first so you've got plenty of material. Then, build your summary around your biggest, baddest metrics. 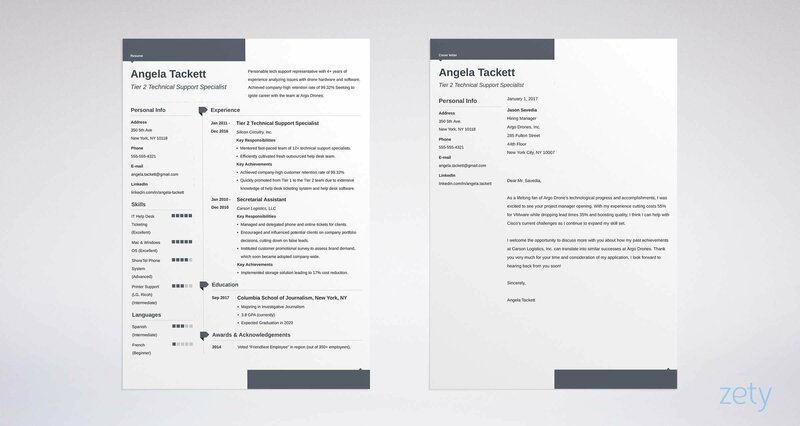 These two sales executive resume samples show how. Sales executive with 8 years experience, skilled in cost-cutting, customer retention, and budgeting. Seeking senior management position with a national firm. Fulfilled all sales executive duties and responsibilities for large IT firm, including setting quotas, training, and driving sales cycle. What's wrong with that bit of executive level resume writing? It's strictly off-the-rack. Your resume summary should wake that senior executive like a thousand chocolate-covered espresso beans. Passionate sales executive with 8+ years experience, skilled in new business development and communication. Seeking to dramatically increase Northwestern Mutual's KPIs. 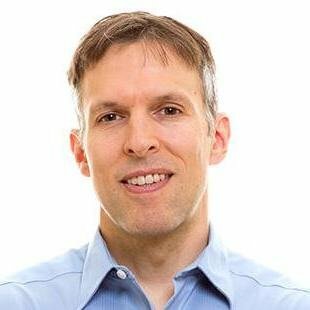 Raised revenue 22% at Karma MS, increased ROI 30%, cut costs 35%. Grew business 77% at Apexi Inc.
That second sales executive resume sample says it all. The senior exec is thinking you're the next Jack Welch. The difference? Metrics. Corporations want results, and you've just shown you own them. The same strategy works on an IT executive level resume or marketing executive director resume. Pro Tip: Had a lot of different jobs? Don't fret. A study of 459,000 LinkedIn members proves executive resumes with several job functions are more likely to succeed. Meet the senior executive. His name's Alan. He has zero time to read your excellent executive resume. Yet he wants to know beyond a shadow of a doubt that you've got mountains of experience. Prove your strength the way you'd prove the ocean's power to someone who has never seen it. Not with a picture of every wave it ever had, but with a few impressive shots. Start by reading the job description. Highlight the executive duties and responsibilities. Research the company. What are its goals? Its challenges? Then, for every job you list in your executive resume experience section, add 4-6 bullet points. Prove you are their knight in shining mid-weight cashmere. Let these two samples from sales executive style resumes light the way. Imagine a widget company with flagging sales. It just announced a drive to open up new sales channels. The job description calls for increasing revenue, sales leadership, cutting costs, and communication skills. Led sales team for a large IT firm. Set and managed quotas, trained sales staff, and drove full sales cycle. Surfaced new revenue opportunities, enhancing pipeline to boost revenue company wide. Increased total sales by 22% across 15 regional territories. Facilitated real-time communication of all sales goals and initiatives to all stakeholders. Increased ROI 30%. Prepared all sales budgets and forecasts. Implemented lean sales initiative. Won buy-in and idea generation from all team members, cutting costs 35%. Can you see how that would land the interview? It's as if the director said, "I need a Honma Five Star 7 Iron with a lightweight grip," and you handed her exactly that. Responsible for growing client list and finding new business for major IT firm. Grew client list by 25%. Built/maintained a national network of industry contacts and influencers to support identification of fresh business opportunities. Prepared/delivered presentations to clients, showcasing new tech solutions. Grew client buy-in with new products by 32%. Drove sales and revenue KPIs to goals. Increased ROI by 38%. That's not terrible. If you saw both management resume samples without knowing the company, you'd flip a coin. But the first of those strong sales executive resume examples follows Sun Tzu's advice: know the challenge, and yourself. That strategy works just as well for a human resources executive manager resume. Pro Tip: If you lack C-Suite experience, leading a big part of a company also looks great on a contemporary resume for an executive. Remember Alan, our senior executive? He values experience above all else. He doesn't really care about your MBA. You don't wear a Rolex to prove you can tell time. It's a symbol of your ability to get things done. In the same way, the education on your executive resume doesn't prove you went to college. It shows that you were destined for the role. Then add bullet points that prove you fit the job like a tailored Brioni. Received MBA with concentration in sales and marketing. Active swim team member, all four years. Coco Chanel said, "In order to be irreplaceable one must always be different." The account executive resume sample above is as replaceable as a burned-out bulb. For senior project, sold 1,100 units of a silicone bracelet to raise money for breast cancer research. Now that sales executive resume writer was born to get the job. She might be the next Indra Nooyi. But all it takes is knowing the job requirements, then looking at your past for proof that you can nail them. Don't have an MBA? Don't fret. Nearly 60% of all executives are in the same boat. Pro Tip: There's no place for GPAs on a resume for an executive. You're too experienced to boast about how well you did in school. Every candidate puts the same skills on an executive resume, so do skills matter? Not if you don't prove them. On a resume for an executive, absence of evidence is evidence of absence. So, list the skills the company is looking for. Then avoid burying them in a long list of unrelated skills. Let's see that in action, in two sales executive resume summary examples. Imagine ACME Thermoplastics needs an executive. She must be skilled in New Business Development, Revenue Growth, Customer Retention, and Communication. Notice how you added Leadership and Interpersonal Skills to round things out. You have all those skills. You're proud of them. They look good on a resume for an executive. But more is not better. You're making the board members drink from a firehose. To quote Hans Hofmann, "eliminate the unnecessary so the necessary may speak." Then weave the important skills into your sales executive resume bullet points. You'll make the director's choice an easy one. As sales account executive for mid-level logistics firm, managed sales team and sales pipeline and facilitated communication with stakeholders. Handled full sales cycle. Grew business by 77% through creative strategies. Communicated with clients to understand pain points. Increased customer retention 35%. Consistently exceeded sales goals, increased revenue 54%. Success. You picked the right skills, then you backed them up with metrics in your best executive resume. That's a Blue Ocean Strategy for job hunting. Of course there's no cookie cutter list of executive resume skills. The right areas of expertise on a resume vary by industry and job description. No matter whether you’re writing a financial executive or a healthcare executive resume, the list below makes a nice jumping-off point. Add to it from your own experience, and from job offers online. Follow the plan above, and your account executive resume will make you look like Anne Mulcahy or Brad Smith. Pro Tip: Worried you're not really "proving" anything with your executive resume skills list? Don't worry. You'll have time for hard data in the interview. "This guy's got a solid background." You want the powers that be to speak those words when they first glimpse your best executive resume. Certifications can be a gamechanger. Executives need a strong financial background, so CPA or CFP certifications can help. Depending on your industry, a law degree, sales certification, or other certificate may also look good on a resume for an executive. If a certification is central enough, add it to your name as well. A certifications list can give you a Howard Schultz aura at a glance. Pro Tip: If you've got a certification the company won't care about, save it for a different application. The idea of an executive resume isn't to impress, but offer value. Victor Kiam said, "In business, the competition will bite you if you run. If you stand still, they'll swallow you." Your competition is the stack of 200+ resumes for executives on the boardroom table. Yours is in the "second look" pile, with 50 others. Now how do you get it into the top 10? Share non-work accomplishments that show your sky-high bandwidth. Take a look at these awards and acknowledgements resume examples. My article on influence in "Brain Blogger" got 1.5 million views. Headed the team that received the Northeast Shingo Prize. Active member, Sales and Marketing Executive Association (SMEI). My Sales Podcast "Why We Sell," has 5,000 subscribers. See my professional portfolio online at zakarik.com. Dreamforce, 2017 - Spoke on panel about generating new revenue streams. Sales 3.0, 2015 - Spoke on panel about growing new business. How do the C-Suite trophies above help lift a sales executive resume off the launchpad? By adding non-work proof you're passionate and dedicated. Need more help with adding non-work accomplishments? See the sample resume for a senior management position at the top. Pro Tip: Do a little head-scratching for your executive resume "other" sections. What seems fleeting to you may be the one thing the senior exec falls in love with. Picture two board members. Kate and Alan. Kate doesn't read cover letters. Alan considers them essential. If you don't write an executive cover letter, you'll lose Alan. If you do write one, Kate will skip it, but so what? She'll still read your resume. So, write a cover letter. Show your passion for the job and your understanding of the company's needs. Add the senior exec's name if possible, to make it personal. Canics, Inc. has one of the best track records for customer focus in the industry. I say that not just because of your 98% customer satisfaction scores and high customer retention rate, but because I spoke about it in my talk on revenue growth at the Accelerate sales conference this year. Canics' stated barriers to expansion present a formidable problem. As a sales executive who grew market share by more than 100% at Unterworks and Gullfire Systems, I think I'm uniquely equipped to help you reach your goals. An executive cover letter like that will get you called up to the majors fast. Finally, end your cover letter for an executive resume with a call to action. "I'd welcome the chance to talk with you about your needs" works great. Pro Tip: Build good relationships with executive recruitment firms. An executive cover letter works exponentially better if it's backed by an enthusiastic recommendation. You're probably making a mistake. But add your LinkedIn profile — 87% of recruiters check LinkedIn before interviewing candidates. Don't add one, and you risk coming off more like Willy Wonka than Tim Cook. Finally, have a personal portfolio site, and link to it from your C-Level executive resume. A personal site can show your personality, your passion, and let directors dig deeper into your achievements. Check out our guide on how to make a website for professional use. For more help adding contact info, use the executive director resume template up top. Pro Tip: Need to up your LinkedIn game for your account executive resume? Check out our guide on how to make a great LinkedIn business profile here. To custom-fit your account executive resume to the role like a bespoke Bugatti, read the job description and research the company. Focus on the skills the board of directors wants. List those in your sales executive resume. Also, prove them in your bullet points, with metrics. Finally, add "other" sections that tell the story of your competence. The right details can make or break a resume for an executive. Do you have questions on how to write a great resume for an executive? Not sure how to describe your skills or achievements? Give us a shout in the comments! We love to help.